We live in a day and age where even the world’s most far flung capitals are within 24 hours flying time and just one stop from London. Places that even 25 years ago were considered only by the rich or ambitious for visiting are now on most brochures. We are privileged that it is relatively easy to visit some amazing far flung places with ease. The most exotic of destinations are within the reach of those even with a modest budget. One can argue which is the world’s greatest waterfall. Niagara and the Victoria Falls both have their advocates, but for shear size and beauty, with its 276 separate cascades of water, Iguassu straddling the border of Argentina and Brazil, must rank supreme. The falls are 850 miles by good quality roads from Buenos Aires, 700 miles from Sao Paulo and 900 miles from Rio. There are frequent flights from the main hubs and both the Argentine and Brazil host local airports serving the quite large communities supporting the substantial tourist trade and industrial growth. Europeans first set eyes on the falls in 1541 but it was not until end of the 19th century that its glory began to be known, a multi-million visitors per year tourism industry emerging into the millennium. 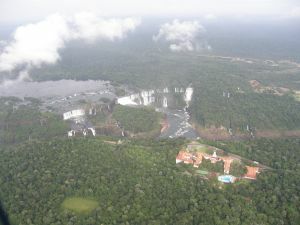 Perhaps the best way of introducing yourself to Iguassu is to take a 30-minute helicopter trip. It is a wondrous initiation. The glory unfolds and the full size and majesty is held in an awesome panorama seemingly stretching for miles. In fact you can view the falls from the air, from the water, and from an island that sits in the middle of the whole complex. Plus from both banks where the authorities have done considerable work in making access easy, even for those with walking difficulties. On the Argentinean side there is a miniature railway that runs down to a viewing complex whilst the Brazilians provide an elevator to the most spectacular of all the falls, known as the Devil's Throat. If you are brave and don’t mind getting wet, powered canoes take you literally under the falling water, the Brazilian access further along the river, giving longer on the approach and perhaps a more thrilling ride. On the Argentinean side a steep pathway takes you down to the river level and a free ferry to the island of San Martin where you should have no difficulty in climbing up to the top and some splendid views. 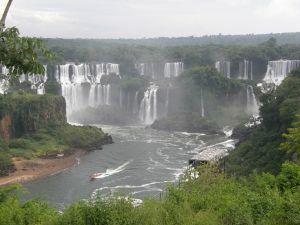 The Argentinean part of the river offers a larger variety of cascades but from the restricted Brazilian bank there is more to see. Visit both countries. The border controls are as simple as they could be. The falls may be nature offering an outstanding demonstration of an awesome force but just a 30-minute ride away is another water-powered show of authority, the Itaipu hydroelectric power plant, man-made, and the largest in the world in terms of electricity generation. Completed in 1984, the main dam structure hides a one kilometre-long turbine hall containing 20 generating units each having an output of 700mw. Regular tours are organised into this vast cavern, part of a guided visit that includes the fascinating eco museum, in the reception area complex, and the Bela Vista Biological Sanctuary, a fascinating multi-national animal haven. Jaguars, capuchin monkeys and skunks can be seen in special natural enclosures. Standing on the top of the dam the sheer magnificence of the complex can be seen, the man-made lake stretching back 100 miles and 40 miles in width at some points. 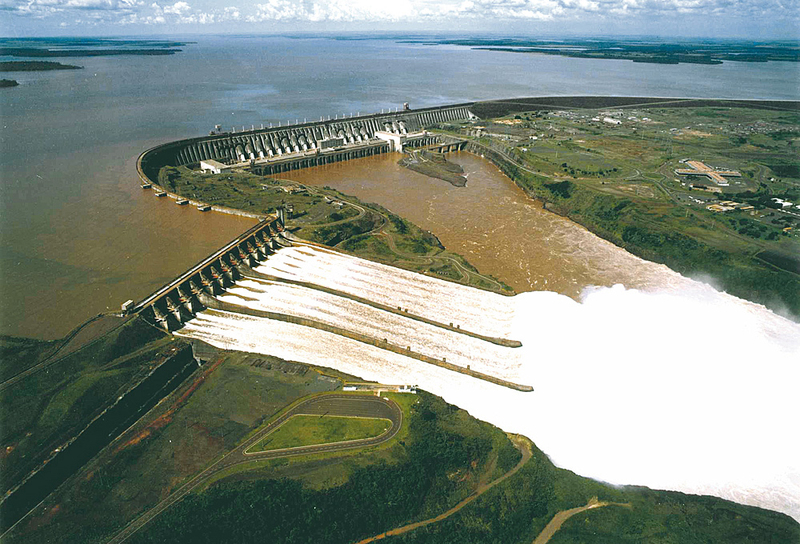 Itaipu is a 50/50 development between Brazil and Paraguay but South America’s largest nation in fact takes 90% of the electricity produced, or 19% of its total power requirements. Payment for the extra energy a very nice earner for one of the poorest countries in the continent. Iguassu is not just the massive water highlights, magnificent as they are. 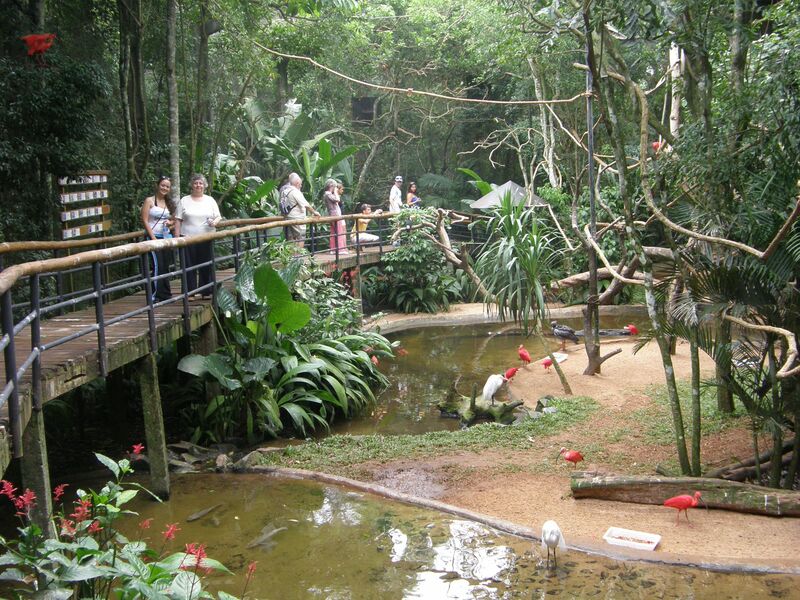 Make sure you give yourself enough time to visit the Parque das Aves (aviary) on the Brazilian bank close to the heliport. Set in 12 acres of lush subtropical rainforest you don’t have to be a bird fan to appreciate the splendid and natural way the sanctuary has been laid out. A large number of birds are in huge walk-through aviaries, some 80ft tall and at least 200ft long, allowing visitors to watch the feathered folk interact as they go about their daily routines. Highlights include the toucans and multi-coloured tanagers as well as roseate spoonbills, herons and egrets. Signage is in English and allow two to three hours. It was founded by a British couple 25 years ago.